Every year the cute coastal town of Whitstable, southeast coast of England, holds a festival celebrating their great produce of Oysters. The celebration includes lots of different activities, competitions, live music, markets and lots of fun. My family have a small family caravan nearby so every year we have attended the festivities, this year's event was amazing! The festival started well with a parade down the street, a buzzing food market selling lots of great quality local produce, a stage full of live music from acts such as The Cuban Brothers, and craft activities for children. The theme for the festival this year was a Venetian masked ball so workshops were put on for children to create their very own decorated mask. The festival continued across the week. Other events included a charity dog show, vintage markets, a outdoor cinema screening of films including West Side Story and Finding Nemo, Sean Lock made an appearance at a local venue to present the audience with a comedy show, a crabbing competition for the kids, an oyster eating competition, the making of grotters (small dome-shaped structures made from oyster shells and lit inside with a tea light), muddy tug of war, and a Venetian themed finale with fireworks. Overall it was a jam-packed, fun week with people smiling everywhere. I would definitely recommend this celebration to people of all ages and you are guaranteed to smile and have fun! 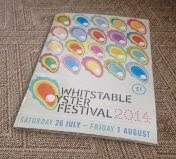 If you are not able to attend the Oyster festival next year, ensure you make a small trip to Whitstable and any time of the year. The small town on the beach is a lovely place to visit due to the streets of shops, lovely beach, local pubs and restaurants, and friendly people.